It’s among one of the greatest finds of the human race, and there’s nothing quite like it. It’s the work of a bearded Russian with a hell of a character and a millennial prophet look. It has amazing powers, like the capacity of predicting its own future. It’s the world’s most complete census ever, and it still can be fitted in a single page. Besides, its visual charm seduces even the most insensitive to scientific joy. 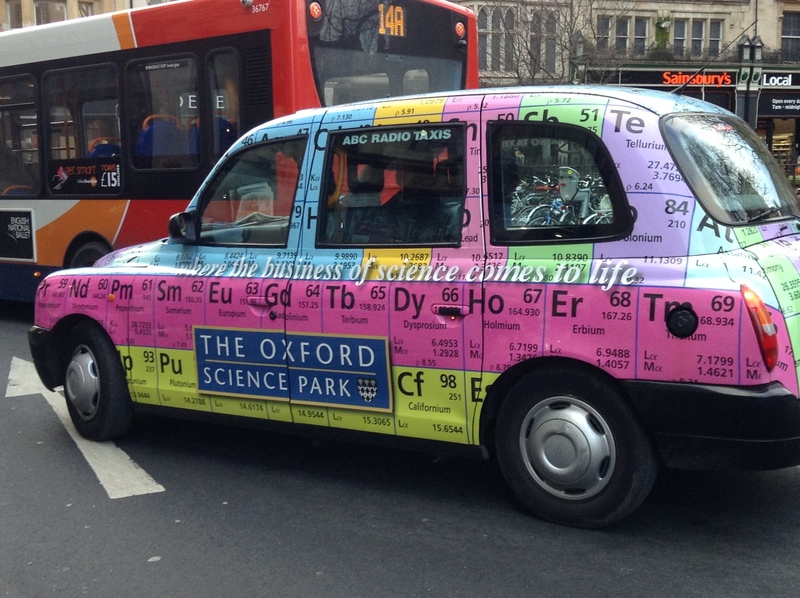 We’re obviously talking about… The periodic table of elements! The merit of its author, Dmitri Mendeléyev, is not only due to having proposed a graphic scheme able to order elements for their atomic structure and systematising all the information we have of them, with the pragmatic and pedagogic advantages this entails; it resides, above all, in having discovered, along the process, a repetitive pattern as powerful so as to identify its voids and forecast the characteristics of elements that hadn’t been identified yet. And also of correcting those that had been incorrectly calculated, since otherwise they would have broken the law of periodicity that the table highlights. This precise and visionary pattern, still totally valid almost 150 years later, appeared to Mendeléyev in his dreams, and it hasn’t been almost altered at all since then: A very Russian mixture of methodical rigour and numinous exaltation that hasn’t ceased being useful to modern chemistry. As many other great stories about science, the one about the creation of the periodic table has its secondary characters, and even some forgotten heroes. In fact, Mendeléyev wasn’t a solitary genius that suddenly saw the light were before was only darkness; some of his colleagues, like Alexandre Béguyer de Chancourtois, had been working before or at the same time in a similar classifying project. One of them, John Newlands, came quite close to reaching the same conclusion before him, but some imprecisions deprived him of recognition and he even had to suffer some mockery on behalf of his contemporaries. Alfred Werner is another one of those illustrious subordinates; he devised the characteristic long form of the table, the most famous and widely used, even today. There were many alternatives to it, some as suggestive as Franklin Hyde’s helicoid version or Charles Janet’s 3D spiral (this French amateur’s works were overlooked at the time but much vindicated later on). But it’s Werner’s version, with its classical simplicity, the one that has become the matrix from which most tables are currently generated. Dmitri Mendeléyev was easy to caricature, but didn’t have the graphic potential, by far, of his Opus Magnum. The path towards formal cleanliness and clarity can be smudged and crooked. But the first manuscript of the table made by Mendeléyev already included the seed of a beautiful order. And that is quite something, because we’re not only talking about an infographics landmark and the most iconic of all scientific designs, but also about one of the very few that have become popular beyond its sphere and is even recognised by those who opted for Greek and Latin as soon as they could get away from formulas. With its tenacious lack of permeability with the landmarks of science, popular culture has always been quite slow at appropriating and adapting any of its milestones. The periodic table is a noteworthy exception, and this doesn’t sound too strange since it has many features that could explain this: its modular composition, the boxes of information that combine an austere functionality with the symbolic force of chemical notation, the options of typographic combination and colour that it allows, or its iconic value as a thorough synthesis of the matter. It has been printed on fetishes of geek fashion and has even been included on creative sweets. When an educational initiative needs some advertising, there’s no doubt as to what will appeal the most to the profane but its combination of numbers and abbreviations. And we all have in mind its most famous cameos in TV –Breaking Bad’s title credits and The Big Bang Theory’s shower curtain– and music –They Might Be Giants’ typical composition. We should also mention its illustrated versions, from the experiment with character creation by artist Kaycie D to the strategy of turning the elements into voluptuous manga heroines to make learning easier for Japanese students. Or even the one that belongs to a series of science images that the photographer Kevin Van Aelst composes from ordinary objects. The fact that there are even false rumours that say that the periodic table was actually inspired by Scrabble’s board and chips proves its degree of integration into our everyday lives. The distribution of elements in groups and periods is another aspect that has been widely re-used in the elaboration of alternative tables: here, Star Wars characters classified depending on their affiliation. Using the table in a series starring a chemistry teacher would seem quite obvious; still, Breaking Bad‘s title credits make good use of the schematic elegance of the boxes containing the elements. The Bat-table: an instruction manual for a pop score; a comic and chemical homage to Neil Hefti’s Batman Theme. 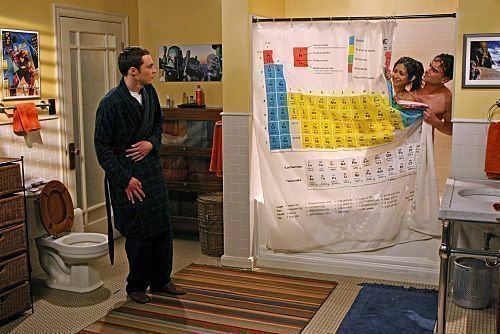 However, its most prolific use by mass culture has been the creation of alternative periodic tables. This confirms the concept we have of it as reference of a strict and detailed catalogue of a field of knowledge and at the same time of a game that can be exchanged to offer multiple possibilities. Thus, we find more or less conventional ones, like those listing types of bears, cereals, Tolkien characters or even hip hop expressions. 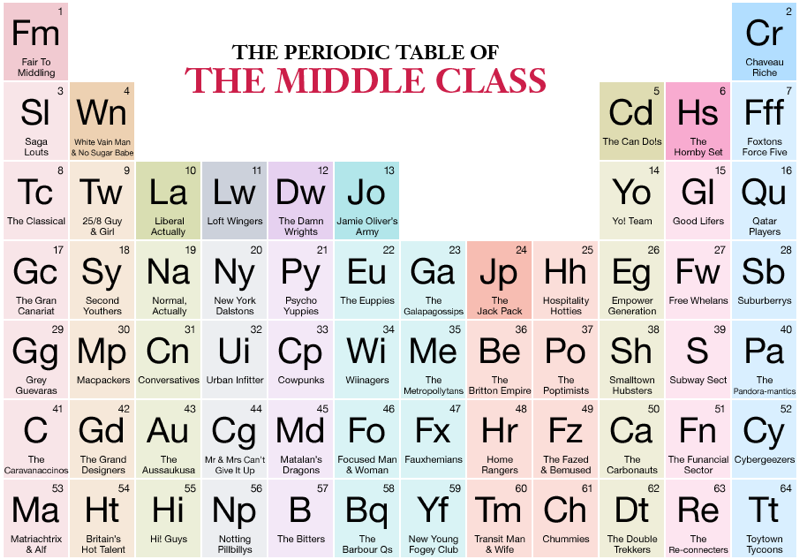 Some of them show a surprising observational and linguistic acuteness (see the periodic table of American middle class types). 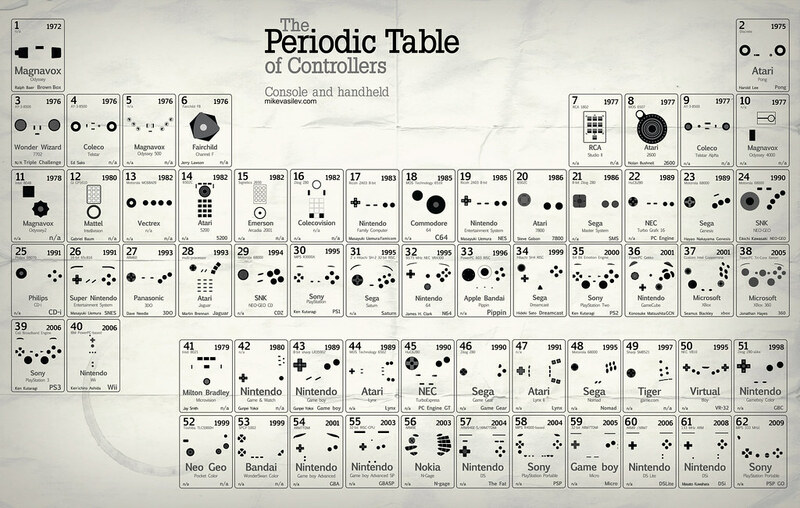 Others imply such nerd pride, self-parodic consciousness or provocative intentions that make them even funnier, from the periodic table of video console joysticks to the pseudoscience and irrational beliefs table. 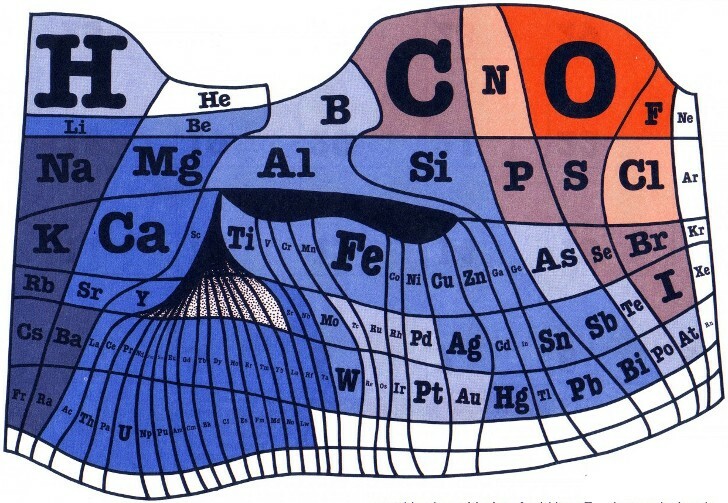 We even have those that provide a useful re-reading of the original one –there we have the periodic table of the elements depending on their relative abundance– or those that are interesting as conceptual works in themselves, like the periodic table of narrative resources. Despite all this variety, only two have become my absolute favourites above all the rest. 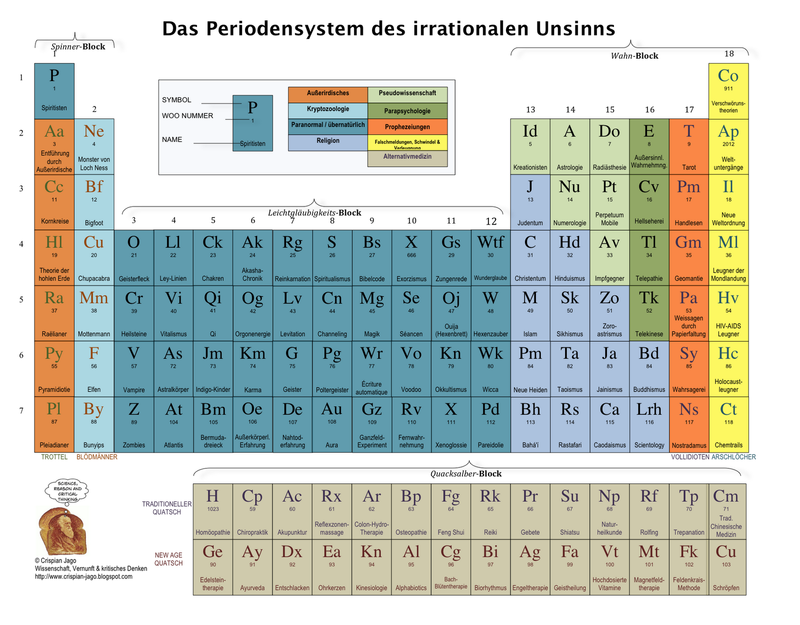 The first one, due to its witty and funny speculative nature: the periodic table of fictional elements. It’s an itinerary through all those imaginary gases and minerals that have appeared on films, books, comic books and videogames, treated as though they were real and equal to beryllium, mercury and co. The second one, on the contrary, stresses the original version’s potential for unlimited expansion. It’s the periodic table of periodic tables, in which, with an Escher-like trick, the table includes itself and so it is projected to the infinite, the true horizon of Mendeléyev’s invention. Particularly now, after it has blossomed with such force in popular consciousness. The table is squeezed and its “castle” shape gives way to a hand making the sign of the horns: it’s the power of metal! Spirals and helicoids have been some of the most defended alternatives to replace the table’s classic format. Not too successful, though, up to now! The anthropomorphic representation of chemical elements is a recurrent idea in illustration and comic books. And Victorian clothes fit it quite well. After all, it’s the time when many of them were presented to society.